Grandmilly & Shozae - Adventureland. Vinyl LP. Bleep. 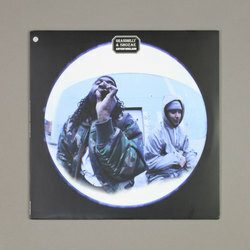 Grandmilly & Shozae cement the partnership forged on two previous EPs with a full-length for Stones Throw. Adventureland is a hard-knocks hip-hop record that has its roots in the towering boom-bap of the early ‘90s. Grandmilly’s been around the block a few times now - both as a solo MC and an affiliate of SpaceGhostPurrp’s Raider Klan - and his years of experience eek out through his bars. His proclamations are given extra clout by Shozae’s imposing beats. The pair’s quiet confidence shines through on cuts like ‘Pleasant Times’, a syrup-slow street track full of grit. There’s plenty of Wu-Tang to this one, a little Gang Starr and early MF DOOM too. Guests include Petey Max and SageInfinite.